FACT CHECK: Was Donald Trump 'Ordered' to Stay Away from Barbara Bush's Funeral? Was Donald Trump ‘Ordered’ to Stay Away from Barbara Bush’s Funeral? According to the White House, the President did not attend the former First Lady's funeral to avoid creating a disruption. 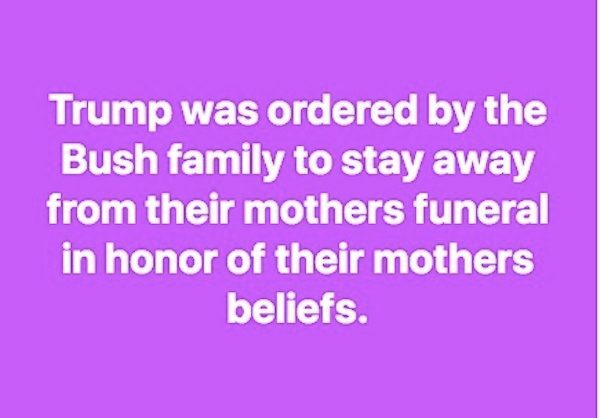 President Donald Trump was "ordered" by the Bush family not to attend former first lady Barbara Bush's funeral. Barbara Bush, who was the mother of former president George W. Bush and former Florida governor Jeb Bush, as well as the wife of former President George H.W. Bush, passed away on 17 April 2018 at the age of 92. After a bitter 2016 presidential campaign in which candidate Donald Trump heavily criticized two of Barbara Bush’s sons (as well as beating out Jeb Bush for the Republican nomination), the Bush family matriarch made it no secret that she was not a fan of Donald Trump. We uncovered no other reports that anyone from the Bush family “ordered” the sitting president not to attend Barbara Bush’s memorial service. Instead, the White House released a statement to reporters saying Trump would not attend out of respect to avoid creating a disruption “due to added security.” First Lady Melania Trump, however, will be in attendance, as will former presidents Bill Clinton and Barack Obama, and former first ladies Hillary Clinton, Laura Bush, and Michelle Obama (along with, of course, Barbara Bush’s husband and sons). Of course, then-President Barack Obama didn’t attend the funerals of Republican first ladies Nancy Reagan and Betty Ford. Neither did George W Bush attend the 2007 memorial services for Democrat Lady Bird Johnson. But Mr Trump and the Bushes are in the same party — and a presidential gesture here could have soothed some raw wounds for Republicans that remain from the tumultuous 2016 campaign. Instead, Mr Trump will spend the weekend at his resort in Florida. Despite antipathy between the Bush family and President Donald Trump, the 41st president made clear he wanted America’s current leader to be at the funeral, putting the institution of the presidency above personal animosities. To his credit, Trump canceled what was certain to be a contentious news conference at the G20 summit in Argentina out of respect for Bush. He also sent one of the iconic blue-and-white 747 jets that serves as Air Force One when a president is aboard to Texas to carry Bush’s casket.